​​​Mobile banking is a secure and easy way to stay on top of your finances anywhere you are. Find out how you can get started and download our banking app today & receive mobile alerts for your personal First National Bank and Trust accounts! Banking all in one place...right from the palm of your hand! Mobile App - for iPhone, iPad or Android*, download on the App Store or Google Play by searching for "First National Bank and Trust". The app looks like the screen below. Sign in with your Online Banking Access ID and Password. 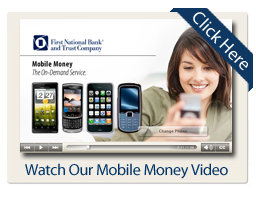 Mobile web - simply type www.bankatfirstnational.com in your mobile web browser. The screen below will appear. Then, sign in with your Online Banking Access ID and Password. *No service charge for FNBT mobile banking. Messaging and Data Rates May Apply. Check with your mobile phone carrier for details. Android Tablet app is not currently available.